Something remarkable has happened. You turned 60! Celebrate being closer to collecting Social Security with 60 Fanci-Frames. These frames are plastic novelty sunglasses without lenses done in a metallic finish available in assorted colors of blue, purple and red. Sorry, specific colors cannot be requested. What better way to rub it in your friends and family’s faces that you’re one more year closer to Social Security than with 60 Fanci-Frame. 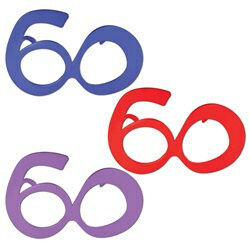 Don’t forget to include Happy 60th Birthday Sign Banner, 60th Whirls (5/pkg) and 60th Gleam N Burst Centerpiece in the festivities.